“DON’T PRETEND YOU’RE TALLER, DUDE.” Dieter McCallum (left) and Isaac Ruder pose with some of the work from their show, Summer Doldrums, at the Volume One Gallery. Isaac Ruder and Dieter McCallum have both been creating art for as long as they can remember. While Isaac found himself inspired by American comics and has been drawing since he could hold a pencil, Dieter’s family recalls his early abilities in special comprehension, like the spider he created by folding paper when he was only two-and-a-half years old. The two have come together to create a cohesive art show, their second show together. Entitled Summer Doldrums, the show will hang through the end of August. While both artists have their own personal styles – Isaac’s approach is more soft, quiet, and technical, while Dieter’s conceptual abstraction has the idea of irony in mind – they both reference a love of and influence from the work of M.C. Escher. Isaac also draws inspiration from the work of Edward Hopper, Edouard Manet, and Kathe Kollwitz. Summer Doldrums feature spieces done in variety of mediums such as charcoal, ink, India ink, and scanned computer-color/edited works. 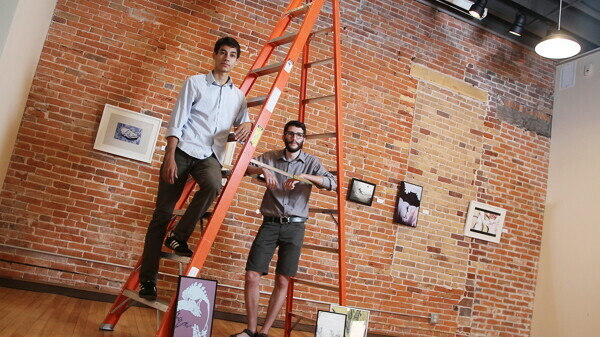 Isaac and Dieter hope that this show will amplify their presence in the Chippewa Valley art scene and that as many people get to see their work as possible. Summer Doldrums will be hanging in the Volume One Gallery, 205 N. Dewey St., until Aug. 31.